I have finished Howlcat with Debbie Bliss Cashmerino Aran (Black) and Jitterbug (October Afternoon). Would probably choose different colours (ie not black) the next time. While I reconciled myself to the welt like stripes on my fingers when I was knitting, I was convinced that a good rinse or two would resolve the bleeding of Jitterbug. I washed it 11 times and it was still giving some colour. Have given up getting a clear rinse from that. Will try washing future skeins and the old vinegar trick. I love the way Jitterbug knits up. 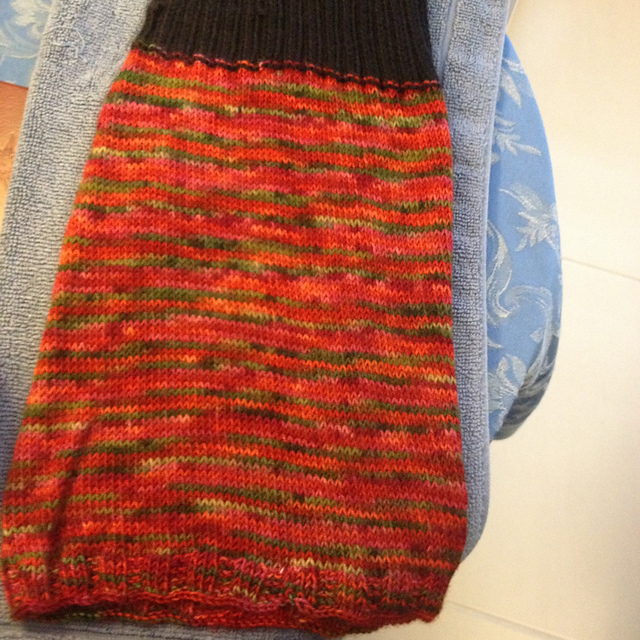 Its still my favourite of the sock yarns I have knit so far… BUT… the colour issue remains a challenge. I’m down to 3 WIPs – two blankets and a pair of socks. Resisting the urge to cast on again. Need to find a patterns that I love!